Hicks Estates | Featured Homes | AAA Realty Group, Inc. This custom built home is located in a private gated acreage community of Davie. The community consist of 10 home sites, of which there are 9 homes and 1 vacant acre lot. 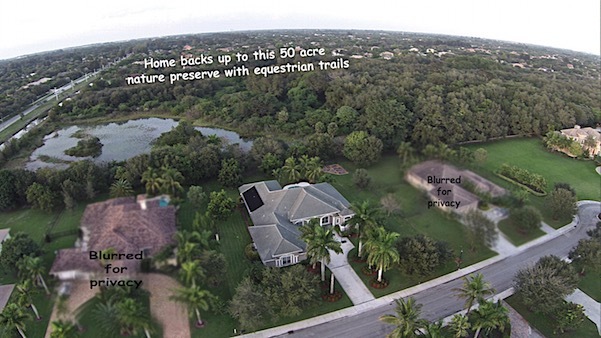 It is surrounded by equestrian trails and bordered by a 165 acre nature preserve. The home was custom built in 2003 and features storm ready Impact glass, hand select marble floors, a new gas cook top, gas water heater and gas dryer. The entire kitchen appliance package was upgraded in November 2014 with all new stainless steel dishwasher, microwave, refrigerator and gas cooktop! In addition to the new appliances, the kitchen features granite counters, fine wood cabinetry, extra outlets on the back splash and a huge walk-in pantry,with an optional second pantry/storage just adjacent to kitchen/dining area. The home offers a 3-way split bedroom floor plan which can be found in the Home Tour Link above.. The master bedroom takes the entire right wing of the home and offers dual walk-in closets, stunning master bath with huge roman tub and separate shower and dual vanity/sink areas. Bedroom 5 is multipurpose, it is 15’4” x 13’0” and originally designed as a playroom with open access to a 17x14 covered patio area. It does offer a full closet and is adjacent to a full bath, but the layout is so inviting for a media room, game room, etc. Exquisite lighting fixtures, window treatments, molding and more compliment the elegant look and feel of this home. The three car side entry garage is virtually the equivalent of a 4 car garage as it is nearly 35’ wide and 30’deep compared to the standard 20’ deep garage. Thus larger vehicles, trailers and boats easily fit. For hi-def photo’s, floor plan, video tour and more please click on the image above or the Home Tour Link.